There’s nothing quite like sitting down after a tiring day with a nice cup of tea and a few biscuits is there? In this busy world we live in where we try to juggle a million and one things at once taking a time out for yourself is so important and what better way to do that than by giving yourself a half hour tea break and enjoying something tasty to dunk in your tea? Biscuits and tea are a classic when it comes to break time. Cookies are a firm favourite when it comes to tea breaks and chocolate chip ones are all the better. But for sufferers of gluten allergies, also known as Celiac disease, having a cookie with your cup of tea can be dangerous. If the cookies contain gluten it can lead to an unpleasant reaction that can leave the sufferer feeling ill and uncomfortable – exactly the opposite of what a relaxing tea break with a few biscuits should do! Thankfully, though, gluten allergy sufferers do not have to miss out. With this great cookie recipe those people with a gluten intolerance can still enjoy the tasty snack without the threat of any repercussions. These can be bought at most large supermarkets but if you are struggling to find them then you could look online. Before you start baking preheat the oven to 180 degrees C, gas mark 4. To begin take a large bowl. Add the white and brown sugar and the butter to the bowl and mix. Once the butter and the sugar begin to blend add the eggs and the vanilla extract to the mixture. Using a whisk beat the mixture until it is well blended. The mixing is very important as it ensures all the ingredients are properly combined. Next take a second bowl and in this add the gluten-free baking soda, cinnamon, ginger, salt and white rice flour. Mix all the ingredients until they are combined and then add the sugar, butter, egg and vanilla mixture to this bowl. Mix well and then add the chocolate chips. Stir well so the chocolate chips are evenly blended into the whole mixture – you don’t want some cookies having plenty of chocolate chips and others having just one or two! 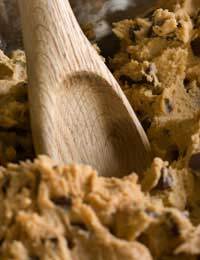 Now, using a medium sized spoon, place rounded spoonfuls of the mixture onto a baking sheet on a tray. Once all of the mixture has been used place the tray in the oven and cook for about 12-15 minutes. Once the time is up remove the tray and allow the cookies to cool slightly before eating. Store the cookies in an airtight container once they have cooled completely.